A two-part investigation I did that uncovered convicted felons working at Weber State University in Ogden, Utah. Click on the related story links once on the page for the full story. As a multi-media journalist, I recently did a breaking news broadcast package as a print journalist for TheSpectrum.com website. 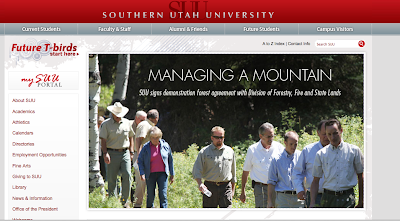 As I was reporting on Utah's first ever demonstration forest, I hiked with important people in Iron County and at the university. The Spectrum's photographer was there and so was one for SUU, I tried to walk near the front of the pack, so the photogs. could get those behind us in the photos. But despite my attempts at trying to stay out of the way, it appears as though I made it all the way to the front of Southern Utah University's ad campaign on their website. As a university student journalist, I ran into many financial fee requirements for FOIA requests. Some were outrageously high for only three paper documents. I was featured as a student reporter and my experience in the national organization SPLC's spring report. Winner of KSL's 2008 Rodney Brady Scholarship for accomplishments as a university student in TV broadcasting. Newspaper reporting experience. Here is a link of portfolio work I did as a summer intern in 2009 at Deseret News.